Twenty years ago yesterday, an eight year old boy came home from school with his sister Becky and found that the man he looked up to, adored and even idolised had committed suicide. That boy is now playing his 50th Test match for England, the pinnacle of his dreams and his career. 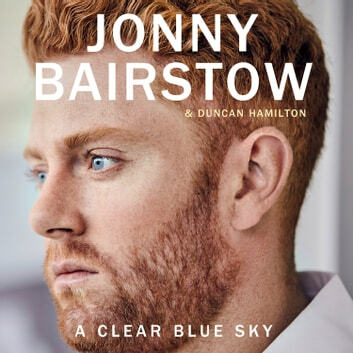 So it is only fitting that I review the brilliant new book by Jonny Bairstow and Duncan Hamilton called A Clear Blue Sky. I have to say it is one of the most moving and honest books that I have ever had the fortune of picking up. I have read a plethora of cricket books in my time. If you want the 'bantz' of the dressing room or the technicalities of this player or that player, then this isn't for you. Instead it is a cricketer who is prepared to open his heart and talk honestly about one of the most difficult subjects that anyone can go through. It is of asking the question why a father would leave a young family behind, never to see them again, something that I can personally relate to, albeit in not such a shocking fashion. The book is heartbreaking at times. A young lad having to take on the duties of being the man of the house at such a young age. The battles of his mother Janet, who was going through chemotherapy for cancer when this awful tragedy happened and the financial struggles of a family who battled on without the insurance pay outs due to the manner of David's death. The piece where Jonny didn't want to ask for new shoes as his were too small, knowing of the fiscal troubles of his mother, brought a tear to my eye. As someone brought up personally in a single parent household, it brought back memories of my own childhood. In fact, even just writing this, I can feel myself welling up, so powerful is this memoir. It is about a young lad growing up with this dark shadow looming over the family, locking it away deep within himself only for it to come pouring out at times, such as a trip with his mates to Cornwall. It is about dealing with the crap that life sometimes throws at us and how we each have our own ways of handling it. I am fortunate enough to have met Jonny and found him engaging company. I took my show, Pushing The Boundaries, in aid of Melanoma UK, to Headingley. Initially I wasn't sure about him and I don't think he was too sure about this Cockney coming up to his back yard, deep in the temple of where the masses who worship Yorkshire cricket, go to pray. With the Question and Answer session looming on stage with Jonny and Jack Brooks I wasn't too sure how he would be - I was dreading monosyllabic answers which would make any interviewer really work for their corn. I needn't have worried. Jonny was brilliant. At the interval, we had a couple of pints of Guinness together at the bar, just two blokes having a pint on their own and he was engaging, bright and good company. I then met him in the Tavern at Lord's after Middlesex had beaten Yorkshire to win the County Championship, a year later. Jonny warmly shook my hand and spoke to me for five minutes again. Therefore, I will fully admit that my account of this book is biased as I like Jonny as an individual, as well as a cricketer. As for David, I never knew him but saw him play. As Jonny admits, he was a man who had a Masters in Anglo Saxon English. I saw him play at Lord's once and Simon Hughes described him in the brilliant 'A Lot of Hard Yakka' as his voice booming out, echoing around the empty stands at Lord's berating his own fielders with throws to his ankles with, "Keep it tidy, you coooont"! But there was a softer side to this son of 'Bratfut', as they say up there, one that couldn't wring the neck of a pheasant that had been shot but still alive and one that would have been a beneficiary of the work that the PCA are now dealing with, with Mental Health issues and depression. Without wanting to ruin your own read of the book, Jonny will be forever compared to David. 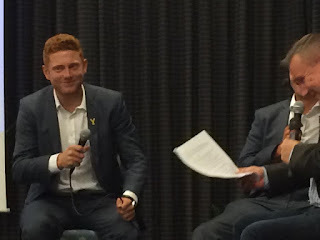 A shared nickname of 'Bluey', the ginger hair, the pugnacious hitting and being a batsman/wicketkeeper who has served Yorkshire and England so well. However, Jonny points out that his temperament is more like his mother and his grandfather, who sadly passed away recently was the one who came and watched him, influencing his career and his life. The England hundred in Cape Town during that memorable knock with Ben Stokes poured the emotions out and is the backdrop to the book. It's not all heartbreak and tears. Sometimes you get a book that makes you laugh and cry and this is one. An account of how a wicketkeeper protects his hands with some using steak, others with their own idiosyncratic methods including one gloveman from days gone by soaking his hands in his own urine to toughen them up, made me chuckle. Brilliantly written by Duncan Hamilton, it is no surprise that this has been named Sports Book of the Year by one paper. The accolades and awards will keep on coming. It deals with tough, emotive subjects and whilst it doesn't have the answers behind the tragedy (I am not sure that anyone will ever know), it is about a sportsman who has really opened his heart up and dealt with an awful event, with maturity and love for his family. His mother and sister Becky shine through as the real heroines of A Clear Blue Sky. Jonny is a sportsman in his own right and he should be fully applauded for his own career. He should also be applauded for this book. Janet Bairstow should also be applauded for her contribution to it too; of holding a family together during her own battles with cancer and for driving her children and offering the love that only a mother can. For that, the book is worth a read on its own. Love the review Dan. I will have to go and buy the book now. I was a fan of David and Jonny is one of my current heroes in the England set-up. Both showed/show true Yorkshire grit in their cricket.